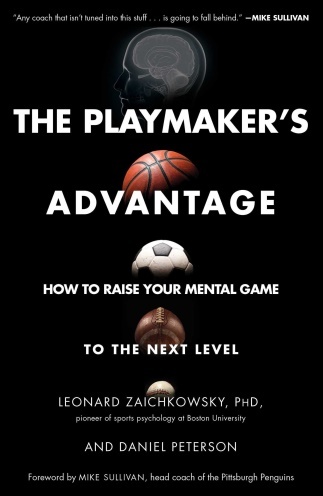 Acclaimed sports scientist Dr. Leonard Zaichkowsky took some time out to talk with the NeuroTracker team about his upcoming book ‘The Playmaker’s Advantage’. Here we’ll cover why this book, which was co-authored with Dan Peterson, is set to drive a new culture of mental performance training for pro and amateur athletes alike. The Playmaker on any sports team possesses an elusive, intangible quality combining anticipation, perception, and decision-making skills. The playmaker can make a plan and make a play under pressure. This quality raises their game above the competition and allows them to pass when no one else can, anticipate the movement of opponents, and avoid costly mental mistakes. They are the decisive general on the court or field, and because of this, they also make everybody in the team better. Sydney Crosby is an iconic example, someone Dr. Zaichkowsky spent a lot of time interviewing for the book, along with many other sports professionals. Dr. Zaichkowksy explained that some coaches don’t even know there’s something missing in their training regime. Others know the importance of the mental edge, but don’t know the training methods available, and aren’t even aware when they are structuring their training around thinking and decision-making skills. That said, coaches are slowly catching on, and there are sports leaders who are going out and preaching that what coaches need to know is how the brain works, how people learn, and how you can teach mental sports skills. As the first person in North America to use NeuroTracker, Dr. Zaichkowsy implemented cognitive training and assessment with the Vancouver Canucks in 2010, “When I look back this was way ahead of its time, and it certainly took a lot of work to get the team to understand the benefits of this fundamental approach”. He used the NeuroTracker for two years, leveraging the cognitive data to guide potential draft choices based on the speed of processing. The aim was to identify smart players, and then to make the most of their skills on the ice. Increasing the speed of perceptual-cognitive processing was important for improving response control for making accurate decisions, as well as managing mental pressure in order to execute plays without errors. Dr. Zaichkowsky is also keen on measuring executive functions with tools such as the AIQ (Athletic Intelligence Quotient), replacing out-dated assessments like the Wonderlic Test. While standard personality or psychology tests don’t tell you much about who is a sharp or quick thinker, executive functions correlate with an athlete’s cognitive aptitude on the sports field or pitch. For example, it’s known from sports science studies that the genius soccer player Andre Iniesta has executive functions that are way above normal and that such measures can even be predictive of goal scoring rates for strikers. “Grit is about the person who never gives up, they have the resilience, and they set the tone for the team. Critically these individuals believe they can always keep getting better. This was certainly true with Crosby”. Even the concept of choking in high-pressure game moments can be something avoided with the right approach. Dr. Zaichkowsky explained that making mistakes is not always choking behavior, often it’s related to the standard of play by the opponent. About Dr. Zaichkowsy – as a professor, researcher, and consultant, Leonard Zaichkowsy has pioneered sport psychology by bringing cognitive neuroscience and sport performance together as an interdisciplinary science. His books and research publications demonstrate the importance of an athlete’s brain in anticipating and acting on opportunities during competition. He has consulted with teams in the NBA, NHL, NFL, MLB, Australian Rules Football, the Spanish men’s national soccer team, and Olympic sports organizations around the world.